Treat yourself to a wonderful soy combination wax candle, guaranteed to fill a whole room with fragrance and burn between 30 and 50 hours. 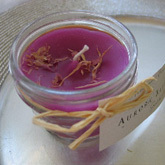 All of my candles are spiritual and intuitive creations from my vast knowledge of scents and their healing properties. 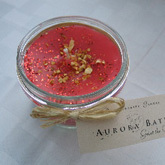 Each is beautifully decorated with flowers and herbs, glitter, shells, you name it (!) and comes with a lid, perfect for travelling. We recommend burning candles only to 1/4" from the bottom of the jar to insure safety and keeping an eye on the decorations on top. NEVER leave a candle unattended! 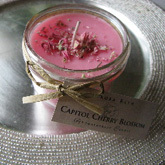 Celebrate spring with a glorious spring floral scented candle. Created in the Nation's Capitol! Makes the perfect souvenir too. 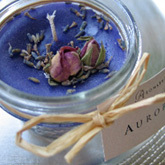 Strong French lavender for deep relaxation. 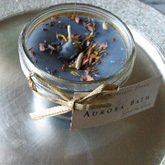 Sooth that stress away with a lovely combination of Lavender, geranium, patchouli and other essential oils. 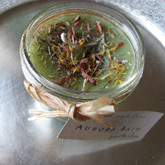 Beautiful and ethereal, a soft Egyptian musk scent (animal product free). What more do you need for a special evening at home? An invigorating start to your day! 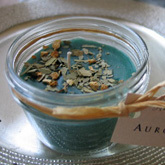 Clears and freshens the air; helps with respiratory problems. 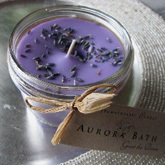 Lavender, rose and geranium; beautiful and relaxing! The nectar of the Hawaiian Gods and Goddesses! An amazing scent with orchid oil imported from Hawaii. Unbelievably gorgeous! Probably our most popular scent. Enhances concentration and improves memory; clears the head and uplifts. Great to eliminate kitchen and pet odors. 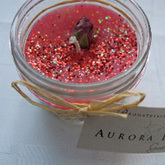 A spicy, saucy blend of rose, patchouli and cinnamon, to get things going in the romance department! 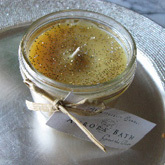 A juicy and fruity blend to scent the whole house! 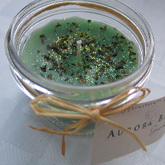 Invigorating blend of refreshing peppermint and cleansing sage. 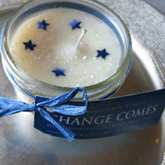 Great for new homes to clear energy fields and bring in positive vibes! Also perfect for anytime you need a pick me up. One of my favorites. 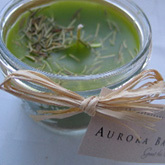 A rejuvenating combination of pine, citrus, verveine, cedar and sandalwood. Upbeat and lively and guaranteed to beat the blues! Celebrate the goddess within! 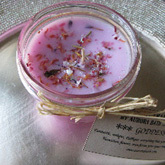 Absolutely Lovely blend of Hawaiian fruits and flowers, creating a gorgeous scent to relax with and just feel beautiful. 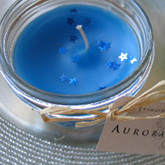 A transcendental combo of frankinscense and myrrh, a truly ethereal scent, great to burn for meditation, yoga, reiki treatments. Change comes, when someone sees the next step! Invite the spirit of change into your life with a extra special combination of 8 essential oils. Be unique!